Managing a restaurant requires extensive multi-tasking and good organizational skills, among other talents and abilities. Reviewing a sample job description is a good way to get an idea of the many responsibilities that go along with this type of position, though exact requirements vary based on company needs. 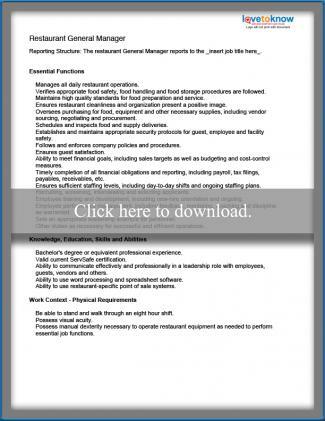 The printable job description provided here outlines many typical restaurant manager duties and requirements, and is designed to allow for easy customization. Click the image to download a sample job description for a restaurant manager position. Depending on how your computer is configured, the document will open as a PDF file, either in a new browser window or as a free-standing file. Once the file is open, you can print or save it, as well as make changes so that it accurately reflects information specific to expectations for restaurant managers in your organization. Details about physical requirements associated with performing the job. Before making changes, review How to Write a Job Description so that you're aware of the best way to determine what should be included and how the information should be phrased. Make changes to the job descriptions so that it accurately and fully reflects what restaurant managers are required to do in your company. Save: Click the diskette icon in the toolbar, or go to the "File" menu and select "Save"
Print: To print the document, click the printer icon in the toolbar, or go to the "File" menu and select "Print"
It's important to have good job descriptions for each position in your restaurant. If you will also be creating descriptions for other job titles, you may find these sample job descriptions for waitresses and hostesses to be helpful. Job descriptions are important tools for communicating duties to employees, but that is not their only purpose. A well-written job description can be used to help defend your company against charges of discrimination in hiring, promotion and termination decisions. However, one that is poorly written or inaccurate can make your company look very bad in such situations. Before distributing this - or any - job description to employees, it's a good idea to have it reviewed by legal counsel.